Everyone remembers bouncers. From our youthful, wide-eyed point-of-view, they were the big, burly, suited types at the nightclub doors who tried to stop boys and girls having fun. An easy target, one might argue, for playwright John Godber to bruise. And satirise. But Godber, when he originally penned Bouncers in 1977 (and later revised it, in 1983 and 1991), clearly had something more in mind - as do Big Telly and director Zoe Seaton when re-imagining his play for 1980s Belfast in the MAC. 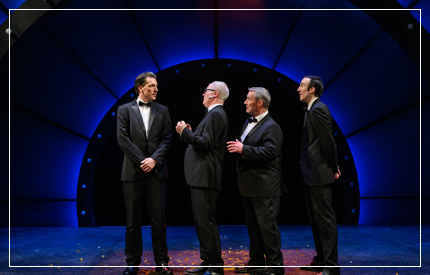 The bouncers we see in Bouncers, played by the multi-talented quartet of Conor Grimes, Marty Maguire, Chris Robinson and Ciaran Nolan, are anything but rigid and regimented. They quite literally bounce, whether they're bouncing around on stage or bouncing positively off one another in Ciaran Bagnall and Diana Ennis's colourfully designed Luminaire Club, brought back to the MAC's downstairs theatre for the first time since The World Goes 'Round. And, like last year's Blunt Fringe production, the overall atmosphere is very cabaret, very appropriate for an energetic exercise in physicality and mimicry set to a plethora of eighties school disco hits, featuring Spandau Ballet, Eurythmics, Phil Collins and much more. Laughs, even squeals, from an excitable audience are pretty commonplace in sight of the multiple male and female roles played in front of them, without the need for costume changes or wigs. Does all that even make sense? Particularly in light of what bouncers are supposed to be? Actually, it does, considering both Godber's modus operandi and the nature of Big Telly's increasing collection of theatrical oddballs. (Rules are made to be broken as far as Seaton is concerned.) Godber, as his Teechers showed, is fond of deconstructing "the system", taking the stereotypes embedded in our minds and breaking them down into something interesting, very funny... and disquieting. Beyond doormen Lucky Eric (Maguire), Les (Nolan), Ralph (Robinson) and Judd (Grimes) who want to be more than what they are, we have the boys, the girls, the hairdressers, the DJs, the taxi home... absolutely everything that comes before, during and after nightclub life. Not just in the eighties, but also today. This is nightclubbing through both a loose and authoritarian prism – the value, hilarity and horror of letting oneself go and trying to have a good time alongside the thoughts and hopes of men who are legitimately concerned for young well being. Who know how naïve and foolish students and ravers can be beneath a macho or undaunted mask. Timing might just be everything. As I pen this, the UK is facing an identity crisis, in serious danger of Brexiting without a deal. Therefore, Ralph's remark of "you just have to let people do what they want. That's my philosophy" comes across as chilling, not unlike the fiery brilliance of Edgar Wright's The World's End. It's easy to see clubbing as a temporary release from nightmarish realities, where, as Marshall Mathers III once said, you can lose yourself in the music and the moment. But if your night doesn't go according to plan, you're contemplating deafening noise, nowhere to move, nowhere to hide, nowhere to talk, and a lot of money wasted... it's all rather crazy. Like society. It can be just as scary for the bouncers themselves, who are, effectively, bureaucrats, bound to a system that frankly isn’t kind to them. Imagine the madness of facing the music without really being able to enjoy it - and yes, I do believe there's at least one Madness song in there. Yet for all its inner madness, Bouncers is, first and foremost, a house of fun from beginning to end - another terrific balancing act of a production from Big Telly. We wince, we laugh, the actors leave to deserved cheers and applause - and everyone's a little happier and wiser from the experience. It's that kind of show. Bouncers runs at Belfast's MAC Theatre until Saturday April 20. More information is available here.